Why Join Our Kit-of-the-Month Clubs? 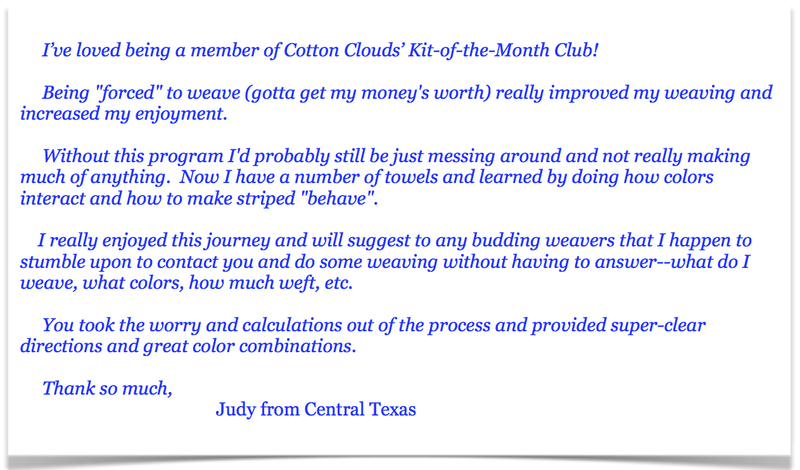 Cotton Clouds specializes in over a 1000 kits for weaving, knitting and crochet! We’ve organized many of them into 20 Kit Clubs to make online ordering so much easier. What better way to stay motivated in creating your favorite projects than to join one of these clubs. Each kit contains just the right amount of yarns to complete your project, access to step-by-step instructions that guarantee success. Our kits save you time, money and the hassle of figuring out what you’ll need. Once you join, you’ll automatically receive a kit either every (12 month club) or every other (6 month club) month, right to your front door! Receive FREE Shipping on every Kit-of-the-Month Club kit! That’s free to all addresses within the 48 congruous US states. We allow 10% off your kit to all other addresses. 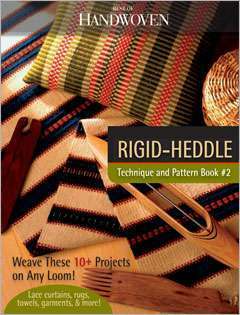 Learn a new skill while being productive! Not only will you stay busy weaving, knitting and crocheting, but you’ll learn many new skills and techniques as well as explore a variety of Cotton Clouds’ yarns in the colors you love. Discover how unusual color combinations work in these time-tested, 100% Satisfaction Guaranteed kits! 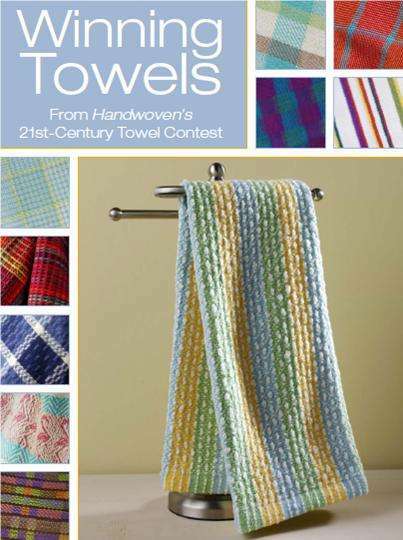 Towel Lovers on four-shaft looms delight in our Treasury of Towels and Winning Towels, Top 10 Dish Towels. There is also an 8/2 Project and 10/2 Project Club, a Weaving for Home Club. Eight-Shaft weavers have a great opportunity to use their loom to the max with our Runners on 8-Shafts Club and Top 10 Towels on 8-Shafts Club. Four-Shaft weavers will also love our Table Runners Club to weave elegant and practical runners for every occasion! 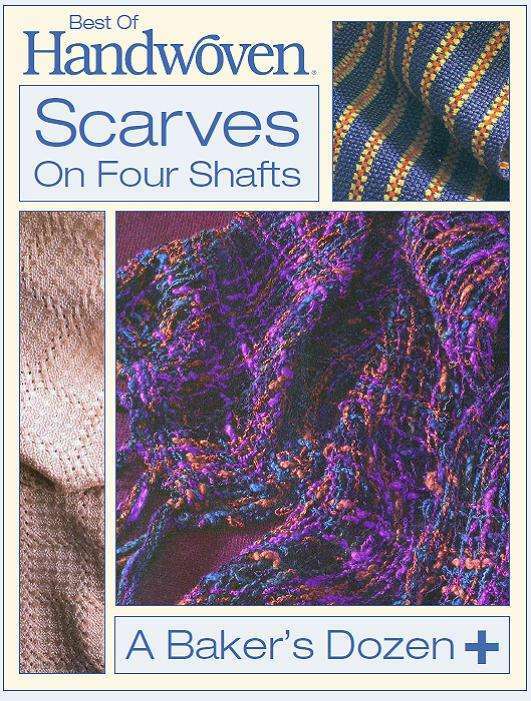 Knitters have been raving about our Knitting Scarf Club. They love the experience of knitting our best selling cotton and cotton blend yarns. 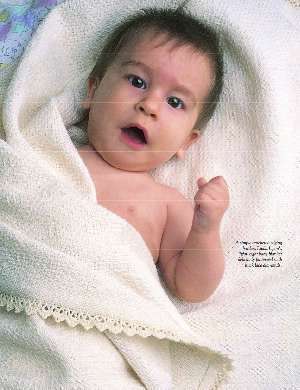 Babies, Babies, Babies love to be wrapped up in our best selling natural yarns. Choose to weave either four or eight luscious baby blankets with our Baby Blanket Club. When you join our Basic Baby Blanket Club you’ll receive one kit every other month for a total of four kits; join our Deluxe Baby Blanket Club and receive one kit every month for eight months. Sock Clubs are just plain fun! Imagine the luxury of knitting or crocheting yourself lots of socks in natural fibers and lots of fun colors! When you join either of our knitting or crochet sock clubs, we include a book with your club to guide you step-by-step through creating the perfectly fitting sock. 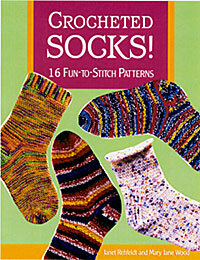 Our Crochet Sock Club includes the book and enough yarn to crochet twelve fun pair of socks. Our Knit Sock Club includes the book and an instructional DVD along with enough yarn to knit yourself six pair of socks. 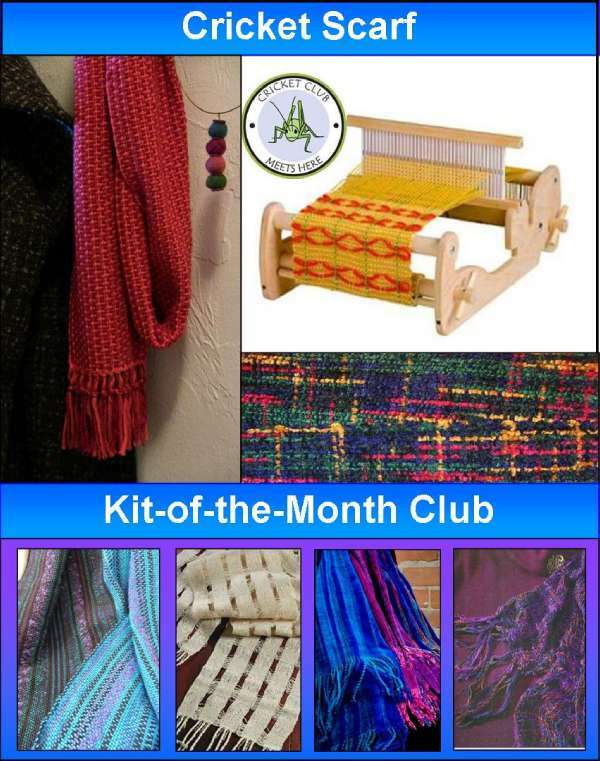 Whether you’re a member of any of our Kit Clubs or not, be sure to join our Facebook Kit-of-the-Month Club Group to see what everyone is weaving, learn new tips and hints we post as well as be the first to hear about our unadvertised sales! Click HERE to view all our Cotton Clouds’ Kit-of-the-Month Clubs. Don’t delay! Join today to start getting your favorite kits shipped right to your front door. 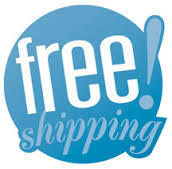 Remember shipping is always free (48 US States) on all kit club kits! You know I’d join, except I have no room for more yarn! Truly!